Uninor the GSM mobile service provider today successfully completed its 100 days mark in Andhra Pradesh by establishing its base in 23 districts, 423 towns and 1328 villages. 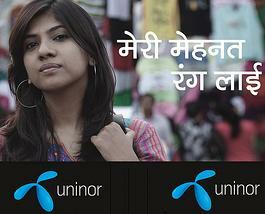 Uninor boasts of 6 Company owned outlets, 14 Franchisee owned outlets and 100 Modern Trade outlets in Andhra Pradesh. On the event of 100 days, Dushyan Vaithiyanathan, Executive Vice President, AP, Uninor said, “I am extremely elated at the response we have received from the market in only 100 days. As a brand, we are here to do much more than to offer a telecom service. Our business is about people – real life, young and aspiring people and we are here to provide our services to help fulfill their dreams and aspirations.